WASHINGTON — An overwhelming advantage in experience and lopsided support from working-class and suburban whites have lifted Republican John McCain to a slender lead over Barack Obama less than two months from Election Day, a poll on the presidential race said Friday. The Arizona senator has a 13-percentage-point lead over his Democratic rival both with men and senior citizens, and a 23-point advantage among rural residents, according to the Associated Press-GfK Poll of likely voters. He’s also doing better than Obama at consolidating support from party loyalists: 94 percent of Republicans back McCain, while 83 percent of Democrats prefer the Illinois senator. Obama has good news, too. He’s preferred two-to-one by those who say the nation’s economy is in poor shape — a strong position on an issue many surveys say is the public’s top worry. He also has an 18-point advantage among voters who look more to a candidate’s values and views than experience, and his weak showing with whites is generally no worse than Democrat John Kerry did in his losing but close 2004 race against President Bush. The poll is in line with others showing that in the days since both parties picked vice presidential candidates and held their conventions, Republicans have gained momentum and erased a modest lead Obama held most of the summer. 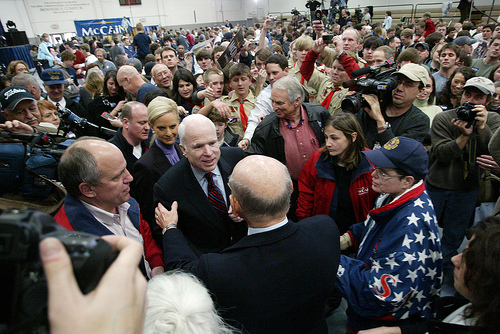 McCain leads Obama among likely voters, 48 percent to 44 percent, according to the AP-GfK Poll. Eighty percent say McCain, with nearly three decades in Congress, has the right experience to be president. Just 46 percent say Obama, now in his fourth year in the Senate, is experienced enough. Fully 47 percent say Obama lacks the proper experience — an even worse reading than the 36 percent who had the same criticism about McCain running mate Sarah Palin, serving her second year as Alaska governor after being a small-town mayor. Underscoring how tight the race remains, several swing groups that traditionally help decide presidential races remain split between the two tickets. These include independents, married women and Catholics. Seven in 10 said Palin made the right decision in becoming McCain’s running mate, despite the demands of a family whose five children include a pregnant, unmarried teenage daughter and an infant with Down syndrome. Men were slightly likelier than women to back her choice, and even Obama supporters were split closely over whether she did the proper thing. McCain leads Obama by 55 percent to 37 percent among whites. That includes margins of 24 points with suburban whites and 26 points with whites who haven’t finished college, plus similar advantages with white men and married whites. The poll finds that despite Democratic attempts to tie McCain to the profoundly unpopular Bush, half say they believe the Arizonan would chart a different course — including a slight majority of independents, a pivotal bloc of voters. In addition, although slightly more call themselves Democrats than Republicans, conservatives have a huge 40 percent to 20 percent edge over liberals. Obama leads 61 percent to 35 percent among voters under age 30. He has about a 5-to-1 edge with minorities and narrow advantages with college graduates and women, though he trails among white women 53 percent to 40 percent. Asked if they prefer a presidential candidate with solid experience or one whose values and views they support, two-thirds picked the latter. While those preferring experience overwhelmingly back McCain, people opting for a contender’s values say they’ll back Obama over McCain, 56 percent to 38 percent. “Obama seems to be more oriented toward getting people together,” said Ron Long, 60, of Pella, Iowa, an Obama supporter. Though Obama led among those who said values were more important than experience, respondents gave a 9-point edge to McCain as the candidate whose values and principles are similar to theirs. He had an 8-point edge over whom people agreed with on issues. In another sign of recent GOP gains, people said they preferred a Democratic to a Republican-run Congress, 46 percent to 41 percent. Several surveys earlier this year gave Democrats a wider edge. The AP-GfK Poll was conducted Sept. 5-10 and involved landline and cell phone interviews with 1,217 adults, including 812 considered likely voters. The margin of sampling error was plus or minus 2.8 percentage points for the entire sample and 3.4 points for likely voters. This entry was posted on September 12, 2008 at 9:51 pm and filed under Race. You can follow any responses to this entry through the RSS feed.